In dead, suffocating heat, Kildare's Championship ended in drama and controversy, with St Conleth's Park being their final place of rest. The home venue which became an integral part of their season's story, whipping up the storm of protest that turned a Croke Park decision in their favour, yesterday witnessed a thrilling battle of wits and physicality. Galway survived, unlike Mayo, and live on into the future narrative of this Championship. Kildare depart with plenty to admire about how they contributed to an endearing spectacle. They did not go easy, and even afterwards there was an air of resistance when Kildare manager Cian O'Neill came out to talk to the media. O'Neill had plenty to say, he didn't need any coaxing. Gallant as they were in defeat, the item gnawing at him was the red card dismissal of Daniel Flynn. O'Neill made no secret of his outrage; he was incandescent over the officiating which condemned Flynn to the sideline only 10 minutes into the second half. Referee Sean Hurson and his officials were the focus of his untrammelled anger. O'Neill emptied himself of frustration; the game was over, the season was over, but the match was still playing in his head. Replays showed Flynn may have deserved some level of sympathy, as he was being held back by Galway opponent Seán Andy Ó Ceallaigh, with the Galway man literally hanging off him. When he swung his arms to break free, it looked like he might have made contact with the man temporarily holding him captive. It wasn't conclusive. Ó Ceallaigh went down; Flynn, one of Kildare's leading marksmen, went off and could do nothing but watch the remainder as a spectator. Who knows how it might have gone had he stayed on the field? GAA matches are notorious for making light of the numerically disadvantaged, but the sense of injustice was eating O'Neill. "Three points was the final difference and maybe that reflected the game itself, but if we were 15 v 15 it would have been a very different game," said O'Neill. "Unfortunately we didn't get to see that." Kildare went out on what was their fifth successive weekend in action. 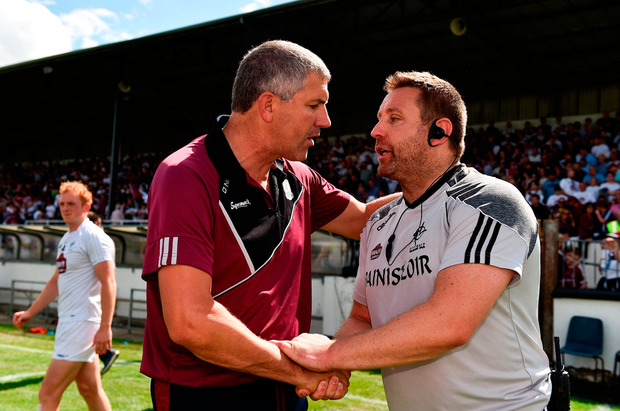 They helped to deliver a compelling match, the atmosphere taut and tense and almost hemming the players in as the outcome was left open until two late injury-time points brought Galway to safety. Three unanswered Kildare scores left only a point between them with five minutes left. In injury-time, a point down, Niall Kelly caught a ball in the Galway square, a huge fetch, and for a moment the visiting followers feared the worst. Galway, though, managed to prise the ball from his grasp and made their escape. Granted, Galway had at least four goalscoring chances, three of them thwarted by Mark Donnellan saves, but the Kildare resilience in the last 20 minutes when playing with a man less reflects well on them as they pick up the pieces and face an unwanted trip to O'Neill's old stomping ground in Killarney on Saturday week. Officiating has been at the centre of more than one management backlash this year. It is hard to know what to say in this case, except that the only way a player can be safe is not to swing back - in the same way you don't retaliate when struck. You cannot depend on officials. That does not diminish the duty of each official to be ruthlessly impartial and fair. "I saw it, Daniel is devastated, he was literally being manhandled, literally being dragged, he was shoving to get the man off him," said O'Neill. "Once again the linesman is doing absolutely nothing and then he literally threw back, it wasn't an elbow or a fist, of course the theatrics come into it, but you can't blame a player for that. You just expect the people who are supposed to be officiating to get those calls right." But it seems a shame to finish on a sour note. Kildare brought something vibrant to the 'Super 8s' after a potentially catastrophic loss to Carlow earlier in the summer. They are showing clear signs of progress at underage. Their heads are down now, but they have every right to hold them high.